It’s a little known fact that singing can cure obstructive sleep apnea – but only if your OSA is caused by weak or flabby muscles in your upper airway. If your apnea is caused solely by a structural problem (such as a nasal blockage, e.g. a deviated septum), singing therapy is much less likely to help you. singing exercise you can do at home. 1. Feel your soft palate rise with the sound as you do when you yawn. And let your mouth open wide and the back of your tongue move down and forward. 2. Pull the back of your throat wide open. 3. Breathe in now, and ready? That is just one example of a singing exercise you can do at home. There are others that can help you tone and strengthen your mouth and throat muscles. 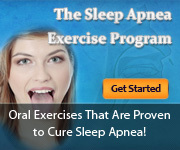 If you’d like to learn all of the songs that are meant for sleep apnea, please click here. When you start your singing therapy for sleep apnea, you don’t have to worry about tune. As long as you aim for energy and precision, you will be fine. Start gently and move along as you get used to the exercises. Patience is key with this type of therapy because it may take a while for you to see results from it. But once you do, the time spent doing these exercises will be all worth it.